The authors describe their surgical approach for achieving adequate exposure of the glenoid in a reverse shoulder arthroplasty procedure. 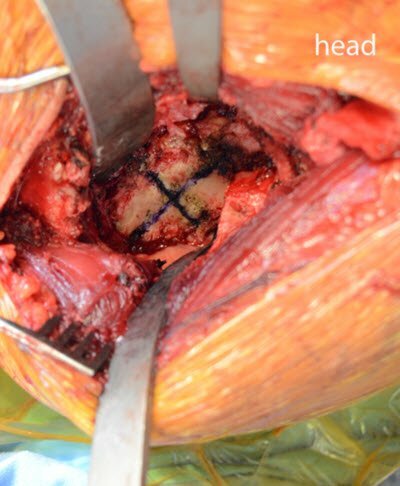 Obtaining adequate exposure is of paramount importance when dealing with the glenoid in reverse shoulder arthroplasty (RSA), as it allows appropriate evaluation of the glenoid and appropriate placement of the baseplate and baseplate fixation. One of the keys to optimizing glenoid exposure is proper patient positioning. The surgeon should be able to adduct and easily extend the shoulder to improve visualization (Figure 1). This can be achieved using a beach chair positioner. Figure 1. Lazy beach chair position on a standard bed with the head of bed elevated about 30 degrees. A hydraulic limb positioner is used to hold the arm. The shoulder is moved over the edge of the bed so that it can be easily extended, adducted, and externally rotated, as shown in this image. We prefer the lazy beach chair position on a regular operating table, with the head of the table elevated about 30 degrees. The patient is then placed with the head on the edge of the bed so that the operative shoulder is leaning off the edge of the bed to allow for extension and adduction. A padded paddle can be used on the side of the bed at the level of the abdomen to prevent the patient from falling off the bed. The head is then secured in neutral position to prevent movement during the case. Release the superior 1 cm of pectoralis major tendon to improve humeral mobilization. Release the entire subdeltoid space, including laterally and posteriorly. Elevate the subdeltoid space inferiorly to the deltoid insertion and posteriorly around the entire rotator cuff. This allows the humeral head to be mobile so it can be retracted posteriorly during glenoid exposure. Follow the biceps tendon up into the joint and perform a tenotomy/tenodesis. Release the rotator interval as medially as possible to help with later glenoid exposure. After subscapularis peel, tenotomy, or osteotomy, release the medial capsule off on the entire medial proximal humerus with progressive humeral external rotation. These techniques will allow less soft tissue tension to displace the humeral head posteriorly and inferiorly on glenoid exposure. Make a generous humeral head cut to allow for increased space within the glenohumeral joint for glenoid exposure. 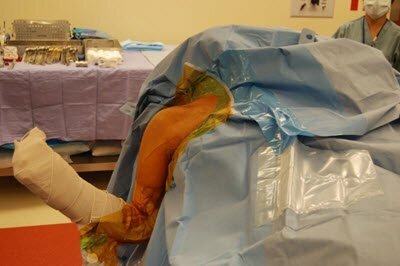 Cutting the head in 20-30 degrees of retroversion also removes the appropriate bone on the posterior humeral head, which increasing the space available to work. Preserve the majority of the greater tuberosity to increase the deltoid wrap angle. Before or after humeral head osteotomy, remove inferior humeral head osteophytes to help increase the working space available during subsequent glenoid exposure. 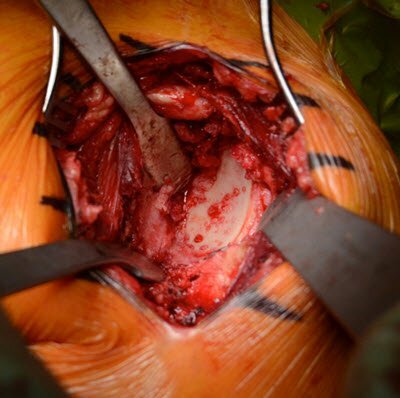 Perform progressive, circumferential excision of the glenoid labrum with capsular release during shoulder arthroplasty. We prefer to start with a Homan retractor for the anterior glenoid and a Bhattman retractor on the posterior glenoid (Figure 2). Figure 2. Left shoulder open view of the deltoid and proximal humerus being retracted posteriorly using a Bhattman retractor on the right of the image. The proximal humerus is seen on the inferior aspect of the incision. Homan retractors are shown retracting the anterior and inferior soft tissues surrounding the glenoid. Once the Bhattman is in place on the posteroinferior glenoid, push the humeral head posteriorly with direct pressure; the arm should be externally rotated with minimal extension. In general, patients with arthritis have a contracted capsule, so circumferential release of the glenoid capsule allows improved mobility of the humeral head with reference to the glenoid. Excise the anterior, superior, and inferior labrum and release the capsule. We prefer to use electrocautery to limit bleeding of the scarred capsule and a shark tooth Rongeur to allow adequate grasping of the labrum in a small space. Place a curved osteotome placed directly over the anterior glenoid to release the remaining capsule and any subscapularis adhesions. Then place a Jobe retractor anteriorly and clip it to the drape with a non-penetrating towel clamp for anterior glenoid retraction. Another Homan retractor can be added superiorly or inferiorly as needed during capsular release/ labral excision. Stay on bone when retracting and excising the capsule inferiorly to avoid axillary nerve injury. The axillary nerve passes from anteriorly to posteriorly just inferior to the inferior border of the glenoid, so be careful in this area. Remove the Bhattman retractor and insert a Wolfe retractor posteriorly. With the Wolfe retractor in place, continue to excise the labrum and capsule posteriorly. The importance of identifying the glenoid circumferentially and especially the inferior glenoid rim cannot be underestimated. This is true especially for patients with posterior or superior wear in which a pseudoglenoid can form. The inferior aspect of the pseudoglenoid can be 5 to 10 mm superior to the inferior aspect of the native glenoid in patients with chronic cuff tear arthropathy. Adequate posterior exposure is also paramount when dealing with posterior glenoid wear to adequately judge the appropriate area for glenoid component insertion. Excellent visualization of the glenoid can usually be achieved through adequate release of the entire capsule. The Wolfe retractor is displacing the humeral head posteriorly and inferiorly, the Jobe retractor is used anteriorly (clipped to the drape), and Homan retractors are used as needed inferiorly and superiorly (Figure 3). Figure 4 shows the retractors that we prefer to use. Figure 3. Adequate glenoid exposure is seen with a Jobe retractor anteriorly (first retractor on the left), a Wolfe retractor displacing the humeral head posteriorly and inferiorly (retractor on the right), and a Homan retractor superiorly. Cross hatch is placed on the glenoid to help determine the superior to inferior direction of the glenoid and is used as a reference for placement of the baseplate cage or center screw. Figure 4. 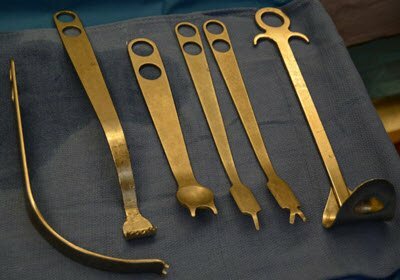 Retractors we prefer to use, from right to left: Jobe retractor, Wolfe retractor, Bhattman retractor, Homan, large forked retractor, Browne deltoid retractor. Once adequate glenoid exposure is obtained, identify the starting point for glenoid reaming. It should be in the center of the glenoid vault in the anterior-posterior plane and such that the inferior aspect of the baseplate aligns with the inferior aspect of the bony glenoid. Anatomic clues can also be used and referenced with the preoperative CT scan, such as the location of osteophytes or a wear ridge as is seen in the Walsh B2 glenoid with significant posterior glenoid wear. The starting point for reaming in a Walsh B2 glenoid is frequently on the ridge or just posterior to the ridge in the anterior to posterior direction. The superior to inferior location of the starting point can also be determined on preoperative imaging, but in general, it should be around 11-13 mm from the inferior glenoid rim. However, the location of the starting point in the inferior to superior direction depends on the type of baseplate and reverse design. We recommend at least flush placement of the baseplate on the inferior glenoid rim. In Grammont-style prostheses (for example, the Depuy Delta Xtend, Tornier Aequalis, Zimmer Trabecular Metal, Zimmer Anatomical Shoulder, and Biomet Comprehensive), the baseplate/glenosphere should overhang several millimeters to help prevent inferior impingement and notching. For the medial glenoid/lateral humerus design (for example, Exactech Equinox), the inferior baseplate lying at the inferior glenoid as the baseplate is offset several millimeters so the glenosphere will allow for some inferior overhang. The lateral glenoid/medial humerus design (for example, DJO Encore) allows the baseplate to be placed slightly higher on the glenoid face due to the lateralization of the glenosphere and a steeper neck-shaft angle. After identifying the glenoid reaming starting point, evaluate the trajectory. The trajectory should be based on preoperative imaging (we use CT scan), as the native glenoid centerline can be evaluated. Glenoid version is defined as the angle between the glenoid centerline (Figure 5 if we can get permission) and the plane of the scapula. Glenoid retroversion should also be assessed clinically and correlated with preoperative imaging. The glenoid centering point (Matsen’s point) can be found as well by sliding an instrument or finger over the anterior glenoid to help evaluate the glenoid centerline. The goal of the trajectory for glenoid reaming is to be in the center of glenoid vault, which tends to be towards Matsen’s point using the glenoid centerline. . We prefer to have 0-10 degrees of inferior tilt, with the overall goal of 0-10 degrees of glenoid retroversion with the new glenoid centerline. Figure 5. 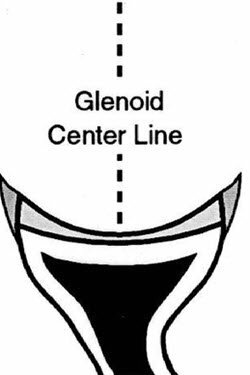 Axial view schematic of the glenoid center line. Used with permission from Frederick A. Matsen, MD; original available here. Once the trajectory and starting point for reaming are determined, use a K-wire or drill to verify adequate depth of the glenoid vault using the new intraoperative centerline. The next steps depend on the system used, but sequential reaming is performed using a cannulated, pilot-tipped, or freehand reamer. The general goal is to remove the remaining glenoid cartilage and leave subchondral bone on which the baseplate can sit. To recreate native version and provide inferior tilt, reaming more anteriorly and inferiorly is generally beneficial; however, this depends on the patient’s anatomy and wear pattern. Enough bone should ideally be reamed so that the entire medial baseplate surface is supported. The glenoid centerline is altered in patients with abnormal glenoid morphology, which is most often posterior. In patients with severe medial and/or posterior wear, there are several options. Humeral head autograft can be used in primary cases, and allograft or iliac crest autograft can be used in revision cases. Some companies also have posterior metal augments on the baseplate that may be used if necessary (for example, the Exactech Equinox). The goal with these options is to lateralize the glenoid face and decrease retroversion to less than 10 degrees if possible. Lastly, choosing the glenosphere depends on the patient’s anatomy and system used. Lateralized offset designs (for example, DJO Encore and Integra Titan) decrease humeral impingement on the glenoid, but also decrease the deltoid lever arm. Some companies with a medial glenosphere design have lateralized options as well if needed. Size of the glenosphere also affects lateralization of the humerus, as well as glenoid coverage. A larger glenosphere in a medialized glenosphere design will improve glenoid coverage and ideally decrease impingement on the glenoid, as well as increase the deltoid lever arm. Joseph J. King, MD, and Thomas W. Wright, MD, are from the Department of Orthopaedics and Rehabilitation, University of Florida, Gainesville, Florida. Rispoldi DM, Sperling JW, Athwal GS et al. Projection of the glenoid center point within the glenoid vault. Clin Orthop Rel Res. 2008. 466; 573-8. Frankle MA, Teramoto A, Luo ZP et al. Glenoid morphology in reverse shoulder arthroplasty: classification and surgical implications. J Should Elbow Surg. 2009. 18; 874-85. Chebli C, Huber P, Watling J et al. Factors affecting fixation of the glenoid component of a reverse total shoulder prosthesis. J Should Elbow Surg. 2008. 17: 323-7. Parsons BO, Gruson KI, Accousti KJ et al. Optimal rotation and screw positioning in initial baseplate fixation in reverse shoulder arthroplasty. J Should Elbow Surg. 2009. 18; 886-91.